By Rachel Held Evans, on April 03, 2015. The cross is a complicated, frightening thing. There, the God of the Universe experienced every imaginable suffering of his creation, right down to the sense of isolation and betrayal when the Divine seems far away. Because of the cross, we are connected to God through suffering. Because of the cross, we can never say God doesn’t understand. In this moment, when Mary’s eyes locked with the eyes of the boy she once nursed, once tickled, once watched fall asleep, I imagine Jesus understood the suffering of mothers, perhaps the most powerful suffering of all. 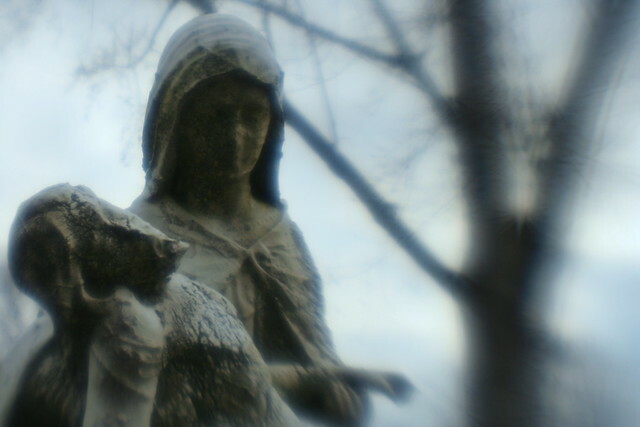 Mary was not the first, nor the last, mother to hold the broken body of her child in her arms. She was not the first, nor the last, to weep in the company of mothers as they stumbled their way to an open grave. It happens every day—when famine claims another little life, when the sudden arrival of blood represents the end of a pregnancy, when cancer strikes yet again, when the phone rings and the news is bad. And, because of today, because of the cross, it is a pain even Mother God understands.